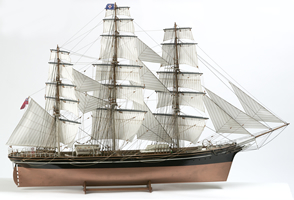 Billings Boats BIL564 Cutty Sark Clipper 1/75 scale wood ship kit! A tea clipper launched in 1869. Length 85.34 m, breadth 10,97 m, draught 6,4 m and displacement of 2,133 tons. The most famous of all tea clippers, the Cutty Sark is today preserved for posterity at a dry dock in Greenwich. Built to transport tea from China, she was designed by Hercules Linton, whose ambition it was to outstrip the Thermopylae, the fastest ship of the times.